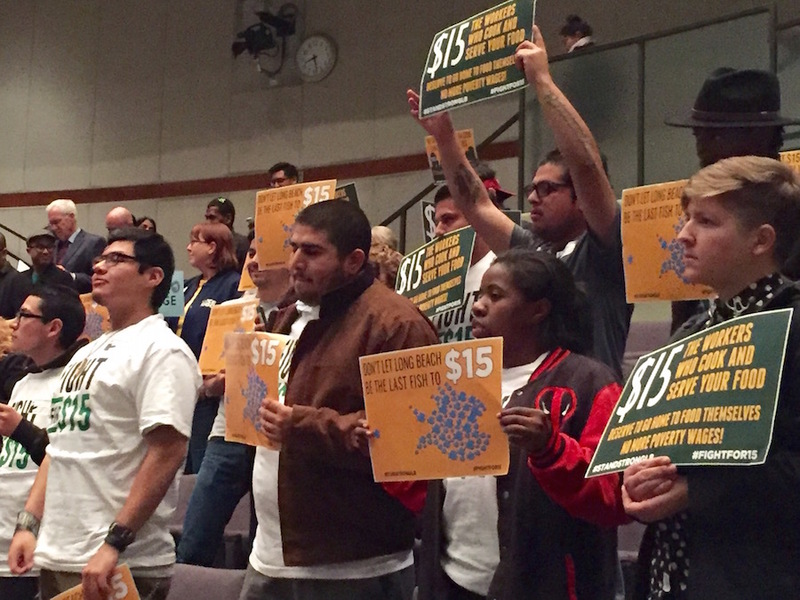 In what’s being touted as an historic move by the California State Assembly and Senate, the legislative bodies moved quickly today to approve a measure that would raise the state’s minimum wage to $15 an hour, the highest of any in the country by over four dollars. The measure now heads to Governor Jerry Brown’s desk for approval and will boost the California minimum wage to $15 an hour incrementally over the next six years, before reaching the $15 mark in 2022. The next closest minimum wage in the country is in Washington D.C. which has a $10.50 minimum wage. Brown said he would sign the bill Monday after the State Senate voted. The wage increase passed through the Assembly by a 48-26 vote earlier today, and was quickly approved by the Senate by a 26-12 margin this afternoon. The vote was largely partisan, with only two Assembly Democrats (Tom Daly-Anaheim, Adam Gray-Merced) voting against the measure. None of the Republican members of the Assembly supported the bill. Assemblyman Patrick O’Donnell, a former Long Beach City Councilman who now represents the state’s 70th district, said that the law, if signed into effect by Brown, will help stave off one of the worries expressed by local business owners during Long Beach’s minimum wage discussions, namely that businesses would flee to neighboring communities that chose not to raise their wages. The landmark decision has moved briskly through the state’s legislature, as it was only three days ago that Brown announced an agreement had been reached between his office, both houses and union leadership in the state to create a law versus employing a costly ballot war before potentially putting the issue up for a vote. Under the plan, wages will increase to $10.50 per hour by January next year, $11 by January 2018 and one dollar per year after that until reaching $15 in 2022. The raise schedule is designed to give businesses with less than 26 employees an extra year to comply. The bill also provides for an annual increase of up to 3.5 percent annually (rounded to the nearest 10 cents) tied to the consumer price index after the $15 mark is reached. In a statement Monday, Brown said that California was proving again that it “can get things done to and help people get ahead.” Shortly after the Senate’s vote this afternoon, Brown announced that he would in fact sign the bill into law next week in Los Angeles. After Brown signs the bill into law, California will become the state with the highest minimum wage but that title may be short-lived, as it’s widely expected that New York will soon follow because its lawmakers have been marching toward a resolution to raise its minimum wage to $15 per hour. The vote signifies a huge victory for labor unions and community groups that have championed the “Fight for 15” movement and perhaps lends a bit of symbolism with the passage coming on Cesar Chavez Day. Chavez helped fight for farm workers’ rights during the 1960s, which eventually led to the formation of the United Farm Workers (UFW) union and the passage of the California Agricultural Labor Relations Act that was signed into law in 1975. The motto of the UFW, “Sí se puede!” has resonated off the steps from city halls spanning from San Francisco to Long Beach, as workers have urged municipalities to increase wages to help keep pace with the cost of living. 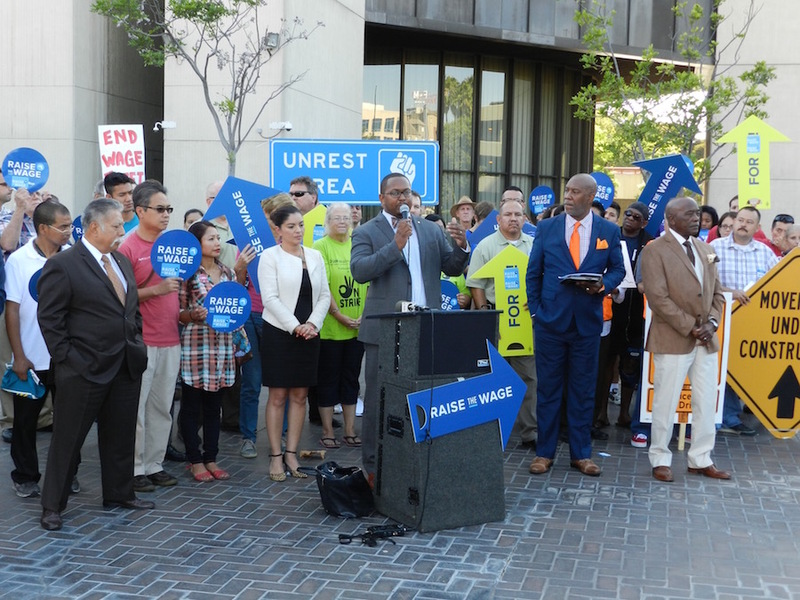 Long Beach had passed its own minimum wage increase in January of this year, a plan that would have boosted the city’s minimum wage to $13 per hour by 2019 with a “pathway” to $15 per hour by 2021. The pathway included a reassessment study of how the wage hike had impacted the city’s businesses before any other potential raises were enacted. The Long Beach plan also had a similar provision that would have tied future increases to CPI. In a statement Monday, Mayor Robert Garcia tweeted out a response to the news that the Assembly would be debating the issue in the wake of the agreement between labor and legislators, noting that a statewide increase would be good for those cities like Long Beach, which had taken steps to increase wages for their residents.